hmmm, who shall I stab in the back next? Economic Affairs Minister Mohamed Azmin Ali today brushed aside a question on why his party boss Anwar Ibrahim was not named as part of the Economic Action Council (EAC), saying the appointments were the prerogative of Dr Mahathir Mohamad. “This is the decision of the prime minister,” Azmin, who is also the PKR deputy president, told reporters at a Chinese New Year gathering today. Azmin, who is also part of the 16-member council, said he felt the current composition was adequate. Perhaps the 16th is reserved for Daim Zainuddin. 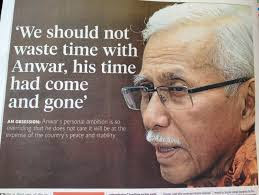 But to omit Anwar Ibrahim is terrible considering Anwar was a former Finance Minister who looked after what Azmin Ali and Lim GE together look after now. If Rafidah Aziz could be selected on the basis of her role as a former minister of Trade & Industry, doesn't the omission of Anwar Ibrahim as a former Finance Minister becomes too glaringly obvious? In 1991, Anwar was appointed Minister of Finance. During his tenure as Finance Minister his impact was immediate; Malaysia enjoyed unprecedented prosperity and economic growth. Shortly after becoming Finance Minister, Euromoney named him as a top four finance minister and in 1996 Asiamoney named him Finance Minister of the Year. 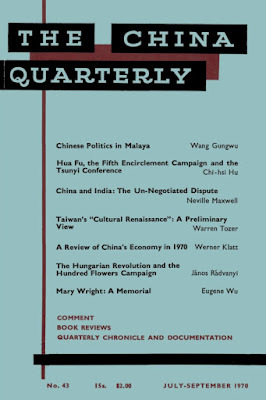 In the midst of Asian Financial Crises of 1997, Anwar was hailed for guiding Malaysia through the period of instability. 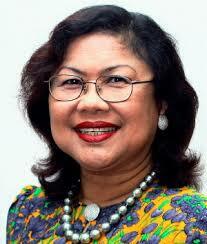 He backed free market principles and highlighted the issue of the proximity of business and politics in Malaysia. He advocated greater accountability, refused to offer government bail-outs and instituted widespread spending cuts. As a deputy prime minister and finance minister, in March 1998, Anwar Ibrahim was selected as the Chairman of the Development Committee of World Bank and International Monetary Fund from March 1998 until September 1998. 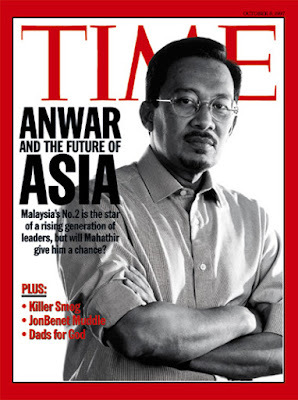 And in 1998 Newsweek magazine named Anwar the "Asian of the Year". Anwar Ibrahim as Finance Minister had far more global experience and track record than any other Malaysian Finance Minister, even Tun Tan Siew Sin. Yet Mahathir snubbed him. And the cruelest cut of all was by Azmin Ali who has the temerity to say that Anwar's absence from the EAC is not an issue. Mahathir has no intention to allow Anwar to succeed him. What remains to be seen us how he is going to do this. 93 year-old won't be able to push himself more than another year or so, maybe only months. old man TM have undiminished resolve to keep DSAI out of the reins of Malaysia. DSAI probably has a complete different agenda from TM , which merely dwell on old thinking which wanted the nation to move forward with one hand tied to its balls. Very straight forward both DPM and DSAI don't have strong financial background so no need to be part of NAEC. Isn't Azmin presence, Dep. PKR President good enough? How come no issues by Ktemoc on reasons why Amanah or the Indians, East Malaysians etc not represented? I guess it all depends on really how one wants to spin any subject just like RPK n his buddies. I've just enunciated DSAI's national and int'l financial experience and TRACK RECORD and here you are saying he doesn't have strong foinancvial background - what have you been smoking? Tell me, does Lim GE has strong financial background at national and international background, other than his controlled tutored 11 months as FM (by Daim and Maddy)? To be fair Guanee did a pretty good job managing Penang’s finances for two terms. He also managed his personal finances pretty well too, ha ha; now he is Finance Minister, not bad for a provisional accountant of 35 years. Toonsie is a man on a mission because he is running out of time. But his ideas to tackle today’s problems are from the 70s and 80s. And I’m not sure Anwar will be much better as PM either. We need to look beyond these two. 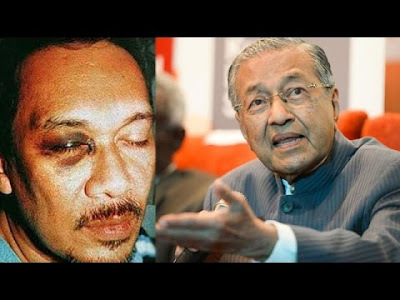 agree mahathir lack vision, what he shd do is emphasize on succession plan, he cant keep on disturb n upset on something he committed n promised to the entire nation, the last 20 years non stop politicking is his doing, he shd make right on democracy n let the system to decide anwar or anyone fate. if he repeat the same, it will come back to haunt him, his legacy n his family. the worst part is we malaysian have to suffer along with him. that said, mahathir strong point is politicking, perhaps this is the only thing he knows. hence msian must shrewd enough to get him out asap.